Relaxation,Swimming & Romance,Fun,Enjoy Family and Friends and the Sun. Escape to a Mediterranean Paradise at this Traditional Mykonian-Style Architectural Villa. 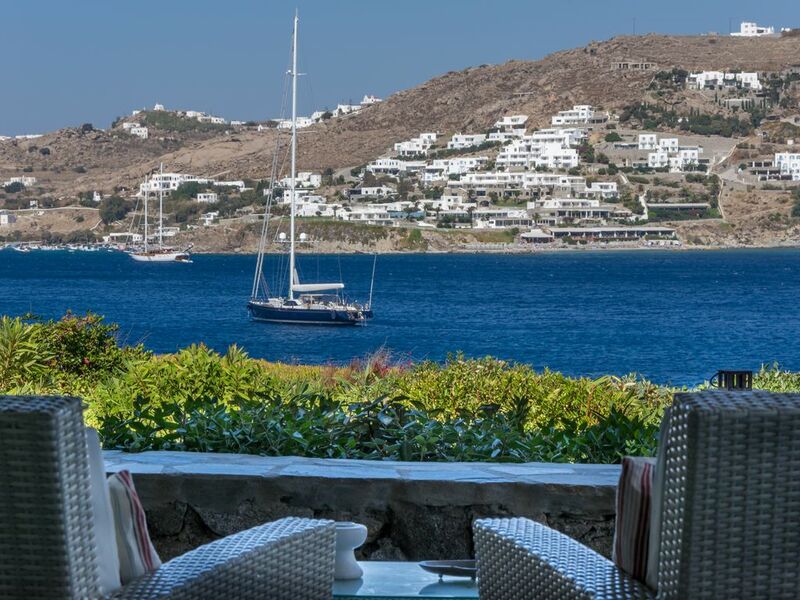 Indulge in the laid-back Atmosphere of the spacious Veranda Overlooking the Crystal Turquoise Waters of the Ornos Bay. Enjoy the Comfort of the Villa's Lavish Interior with all the amenities,you may Desire. Whether you are travelling for a peaceful family retreat or to enjoy the impeccable Mykonian nightlife, Afrodite Villa will surely Surpass your Expectations. MY FAMILY AND I , WE COME TO MYKONOS since 1965. THE AFRODITE HOUSE IS UNIQUE, BECAUSE IT IS ONE OF THE FEW HOUSES , IN THE ISLAND WHICH IS .. COMPLETELY ON THE SEA,.. AS MYKONOS HAS A LOT OF WIND , ORNOS AREA, IS THE ONLY AREA OF THE ISLAND WHICH IS SO PROTECTED, IT IS A MODERN, QUIET,FULLY EQUIPED HOUSE , THAT EVERYBODY FEELS LIKE HOME, AND THE SEA VIEW IS SPLENDID, YOU CAN EVEN HEAR THE SEA AT NIGHT . SEATING IN THE VERANDA PATIO, LOOKING AT THE SEA.. IT IS SO ROMANTIC.. YOU CAN SEE THE SEA OR THE STARS.. ON THE SKY..THERE ARE A LOT DURING SUMMER.. YOU HAVE THE FEELING THAT YOU ARE IN PARADIZE.. OR YOU CAN TAKE YOUR MUSIC OR YOUR BOOK TO SEAT IN OUR BIG SWIMMING POOL, OR AT OUR PRIVATE BEAUTIFUL BEACH.. WITH NO WIND AT ALL.. OUR BEACH IS ,THE ONLY BEACH OF THE ISLAND WITH NO WIND..SO PROTECTED.. ORNOS PLACE ,WITH BEACH , BARS, RESTAURANTS AND SUPERMARKET, AND SHOPS, IS THE MOST NEAREST TOWN BEFORE GOING, TO THE DOWN TOWN-PORT, FOR NIGHT LIFE..AND SHOPPING.. Inside dining Room for, 6 People, Outside dining Room Veranda, for 12 People. A BIG VERANDA PATIO, WITH A GORGEOUS SEA VIEW ,BECAUSE THE VILLA IS , ON THE SEA. Nice property with gorgeous views . The people were friendly at the property . The manager was always quick with her response or answering any questions. The place was large but the beds downstairs were uncomfortable so I gave it a 4 rating. We had to take a lot of taxis to town because it’s too far to walk . You could rent a car. And you told me . that you Always stayed inside the House to Enjoy the Fantastic View. I told you before Coming ..! !that You Need to Circulate in Mykonos to Rent a Car ..You Didn’t Want. You Were ,you and your Girlfriends Very Difficult Clients ! !fromThe First moment of your Arrival, with my Personnel. The New Beds Are new and Big. We stayed at Afrodite for 10 days and had a fantastic holiday. We were a party of 5 adults and 3 children and the villa was more than adequate for our needs, it has amazing views from the large outside covered verandah where we spent most of our time. All the rooms have ceiling fans and with a lovely breeze coming in the property was kept very cool and a lovely respite. The kitchen is very well equiped with everything of a very high quality, lots of fridge/freezer storage. The bedrooms are very spacious and have lots of storage space. Christina the owner gave us lots of information and photographs prior to our stay which was very useful and she did everything to ensure we enjoyed our stay, as the high chair we had requested was not available on our arrival she made sure a new one was delivered as soon as possible. Although we did not meet her we appreciated that we could contact her at anytime. Costa Ilios is a lovely private resort, very safe for the children, immaculately clean, great salt water pool and nice beach both well equipped with loungers and umbrellas. The pool bar and taverna serve good reasonably priced food. All the staff are very friendly. Unfortunately the children’s play area did not have the equipment stated in the information, just a playhouse which the children enjoyed playing in. The resort is a short drive away from Mykonos which is beautiful and you can make it as quiet or as lively as you want! This is the best accommodation I have stayed at in Greece and would certainly recommend it and hope to visit again sometime. Mrs Ruth ,you and your Family were so Easy to Host,so Sweat,So Polite,and Me and the Staff we Had so Good Communication with you and your Family. We thoroughly enjoyed our stay at the Afrodite Villa.Our family of 7 ranging from 27 - 77 felt very comfortable. Christina was very responsive, the house was very clean and well stocked with linens & kitchen items. Everything we needed was available, wifi, washing machine, coffee maker etc. Ceiling fans in all the rooms. 2 of the bedrooms were in lower level which was nice and cool. While it was not walking distance to town, we were completely happy relaxing on patio with sea views watching the super yachts in Ornos Bay, nearby sea water pool with bar and on site restaurant. We did have rental cars and found location to be within short distance to grocery stores, nearby Ornos and Mykonos Town where we enjoyed great meals, shopping & Ferry to Delos. Our extended family of 7, ranging from 27 - 77 were very comfortable and thoroughly enjoyed our stay in Mykonos at the Afrodite Villa. We enjoyed the spectacular views while dining al fresco on the veranda. very comfortable seating for all of us. The resort was amazing, enjoyed the pool bar with morning espresso & wine in the evenings. The restaurant had great food and excellent service. A short drive into Mykonos Town and close to grocery store. We loved the Buddha Bar across the bay. The Villa was equipped with everything we could have needed, Christina was very accessible and committed to providing a 5 star experience. Highly recommended destination. Aphrodite villa is a perfect place to enjoy the quiet at early morning into the private beach or into the residence pool, and it's also only 5 min driving from the crowdy Ornos and 15 min from Mykonos. The front patio has a fantastic view straight to Ornos bay, and the villa can accomodate till 8 people. Truly recommended to enjoy a nice stay with family or group of friends. At The Most Privileged and Beautiful Area of Mykonos.At Ornos Area. The Resort offers you, Our Beautiful Private Beach which is protected from the Wind, with chaizelongs,tables,showers,and Free Umbrellas.